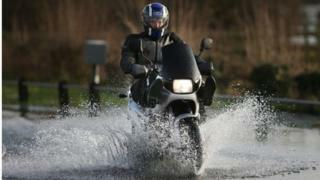 The floods affecting large parts of the country are probably connected to climate change, David Cameron has said. The prime minister told MPs that there were more "abnormal" weather events occurring and he "suspected" they were linked to global temperature changes. Several senior Conservatives, including former Chancellor Lord Lawson, are professed "climate change sceptics". Whatever the reason for the recent weather, Mr Cameron said it made sense to invest in the UK's flood defences. The government has insisted it is spending more on flood defence than its predecessor but critics say budget cuts in recent year have affected planning, maintenance and the capacity to respond to incidents. Shortly after taking office in 2010, Mr Cameron pledged to lead the "greenest government ever" but critics have accused ministers of rowing back on a range of commitments in the face of business and political concerns. Some Tory MP and peers, Lord Lawson being the most prominent, have cast doubt on scientific theories on climate change which argue that human activity is predominately responsible for recent rises in global temperatures. Labour has suggested Mr Paterson, who became environment secretary in 2012, is sympathetic to their views, claiming this may have influenced decisions on flood budgets - claims described as "nonsense" by government sources. Speaking on the BBC's Any Questions programme in June, Mr Paterson said "the climate's been going up and down" for centuries and pointed out that the earth's surface temperature "has not changed in the last 17 years". "The real question, that everyone is trying to address is: Is this influenced by man-made activity in recent years?" "There is almost certainly bound to be some influence by man-made activity but we have just got to be rational and make sure the measures we take to counter it do not actually cause more damage," he said. Mr Cameron made the comments in response to a question from Lib Dem MP Tim Farron, who suggested the recent weather was a "destructive and inevitable consequence, at least in part, of climate change". Mr Cameron replied: "I agree with you that we are seeing more abnormal weather events. Colleagues across the House can argue about whether that is linked to climate change or not. I very much suspect that it is. "The point is that whatever one's view it makes sense to invest in flood defences... It makes sense to get information out better and we should do all of those things." The prime minister said the coalition was committed to reducing carbon emissions and meeting its international targets. "We worked with the last government to put the Carbon Act into place. It wouldn't have happened without our support," he added. "We also have the Green Investment Bank up and running in Edinburgh and it's going to be investing billions of pounds in important green projects."